The Soft pretzel is a Philly thing and we love it here. There have been so many different types of pretzels created, from stuffed to sweet. But there is nothing like a homemade warm pretzel. Making pretzels can be a family activity. My kids enjoyed making and playing with the dough. This is a super easy recipe to follow. 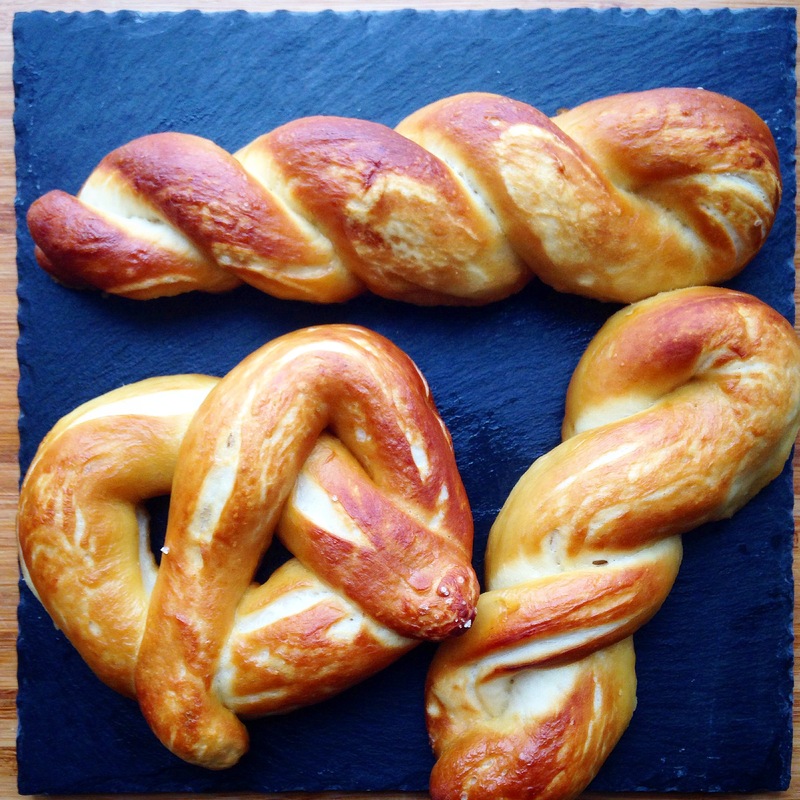 You can use this recipe to create any kind of pretzel from bite size to braids or traditional. Top with salt, leave it plain or add cinnamon and sugar. The dough and crust turned out perfect. I hope you enjoy. In a large bowl add the water sugar and salt, mix and then add yeast on top. Let sit for 5 minutes or until the yeast begins to foam. Add flour and butter and turn the mixer to low and mix until everything is combined( if you don’t have a mixer use a spatula). Turn the speed up to medium to knead for about 5 to 7 minutes or until you have a smooth dough (Use a clean surface to knead if you don’t have electric mixer). Next brush the bottom and sides of a large bowl with oil. Place the dough in the oiled bowl. Cover and let it rise in a warm spot for about 1 hour. Preheat oven 450 degrees, take 2 baking sheets and place parchment paper on top. Spray or brush oil on the parchment paper. Add the water and baking soda to a large pot on medium heat and let the water come to a rolling boil. Now that the dough has risen it’s time to have fun and create pretzels. Cut dough into 12 equal pieces, roll each piece into a rope and make a U shape, then press the ends of the rope at the bottom of the U shape and pinch the ends. That’s the traditional pretzel. But feel free to make any size or braids. Place your pretzels onto oiled parchment paper atop of baking sheet. Carefully place the pretzels into boiling water for 30 seconds, 1 to 2 at a time. Remove from boiling water with a flat spatula and put them back on the oiled parchment paper lined baking sheets. Once pretzels have all been boiled brush them with the egg wash and sprinkle each one with desired topping. Bake 12 to 15 minutes or until deeply golden brown. Cool for 5 minutes on cooking rack. Gorgeous pretzels! I bet they are so much better than Aunt Anne’s! They look absolutely delicious and so so tempting. I remember getting pretzels when I was younger in a brown bag on the street. I would take it home, eat some, and freeze the rest. I love making soft pretzels- I’ve done poppy and sesame seeds for toppings. So, what’s the purpose of blanching the uncooked pretzels, then? Never tried that.